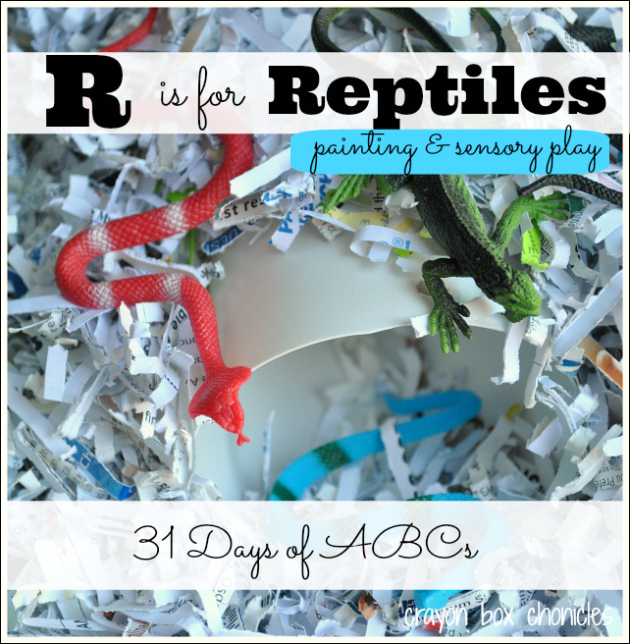 We are so thrilled to be participating in the 31 Days of ABCs series hosted by All Done Monkey! 31 different bloggers will feature a letter, showcasing fun activities related to their letter. There are so many talented bloggers involved in this series to create an incredible resource for learning the alphabet! Also, each blogger will host a link-up for other bloggers to share their posts for the letter of the day! For even more ABC learning, follow the 31 Days of ABCs Pinterest board. R is for Reptiles! 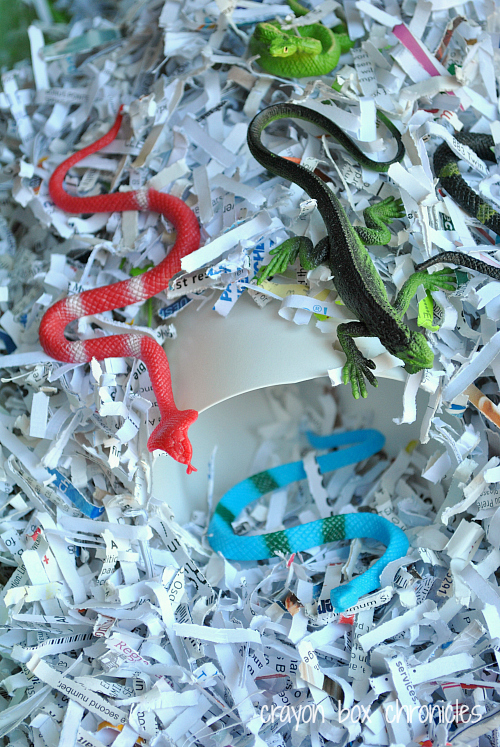 We’ll explore two R activities today — reptile sponge stamping and reptile shredded paper sensory bin. Animals are a big part of daily playtime in our house. C loves painting and sensory play, so I knew he’d enjoy both activities! There’s a little hatchling surprise at the end — all inspired by C! Prepare your paper, taping down the edges. Next, draw the letter R on your paper in glitter glue. While the R is drying, prepare reptile sponges. First, cut the large sponges in half. A serrated bread knife works really well! Be careful! I’ve found the thinner the sponges, the easier the project. 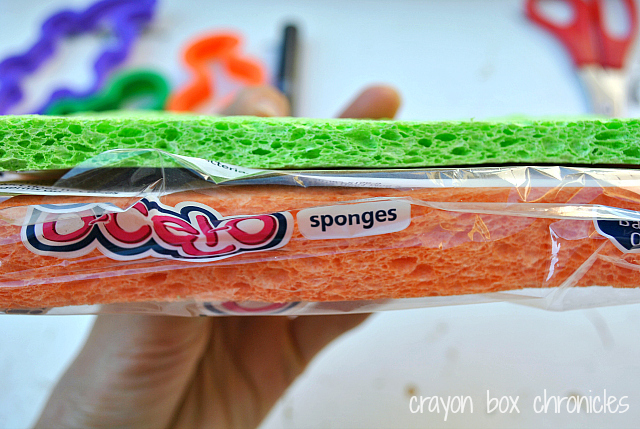 Plus, you’ll double your sponges and have more to experiment with! C’s so silly! 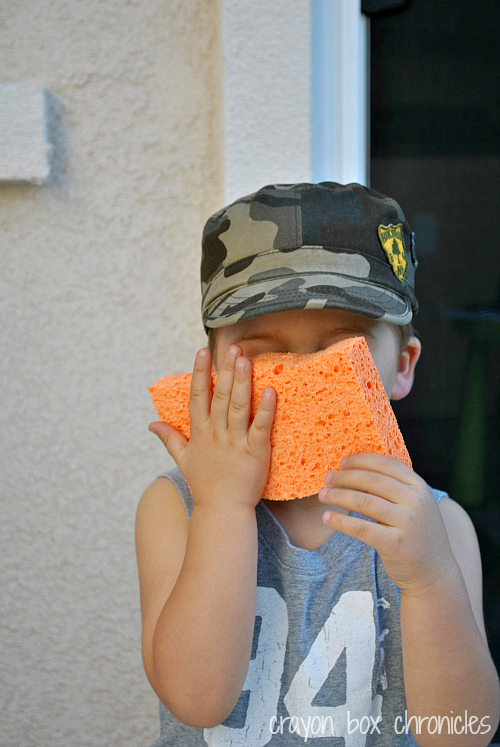 He loves sponges, especially painting and stamping with them! 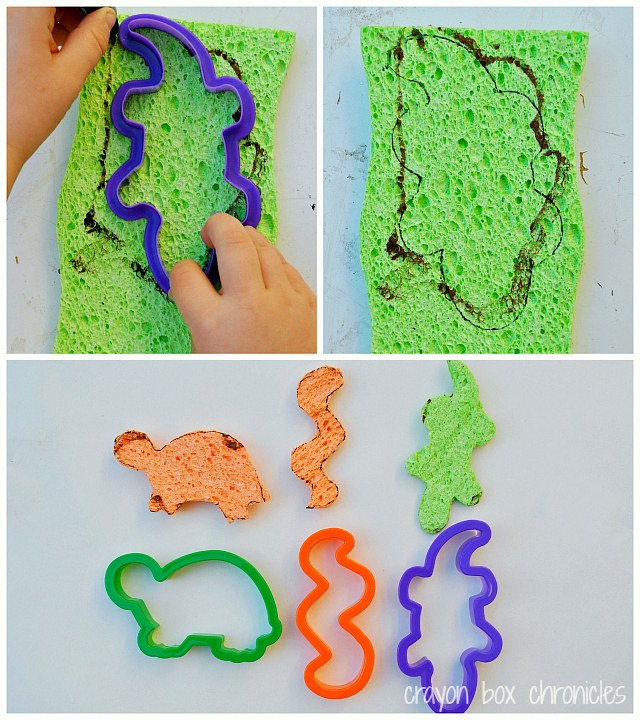 Awhile back we made dinosaur sponge paper for a gift! He’s playing peekaboo! It’s tracing time! Next, it’s the kids turn! This is a great fine-motor boost too. Trace the templates on to the sponges with a black marker. 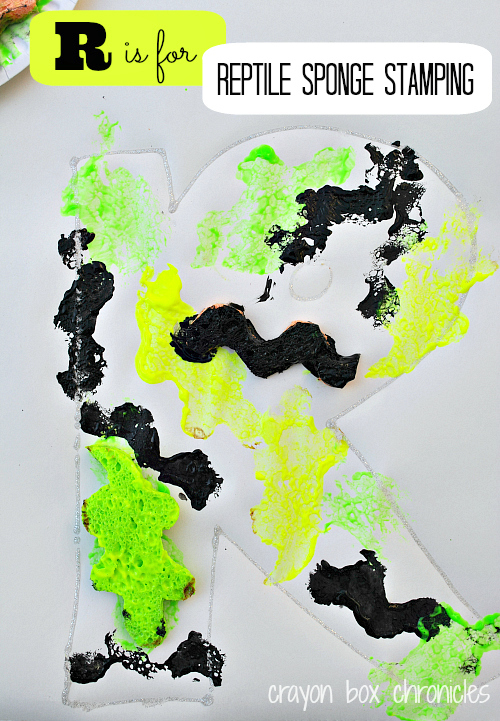 We used turtle, snake, and alligator cookie cutters as our templates and neon and black paint. No cookie cutters on hand? Simply print and image of the internet and use it as your template. C did it first with a maker, then I went back and used a ball-point pen to see more details. Finally, cut them out, using quality scissors and it’s time to stamp — reptile style! Pour, dip, and stamp away! I love C’s facial expressions when he was painting! He kept saying, “Rrrrr …!” R is such a cool letter! Plus, who doesn’t love messy painting, right?! He continued to fill the letter R, staying inside the lines. Afterwards, we played with the sponges on plain paper. 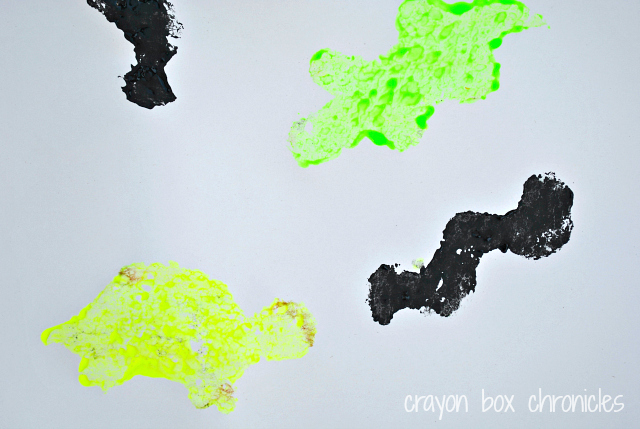 the neon paint really makes the turtle and alligator POP! 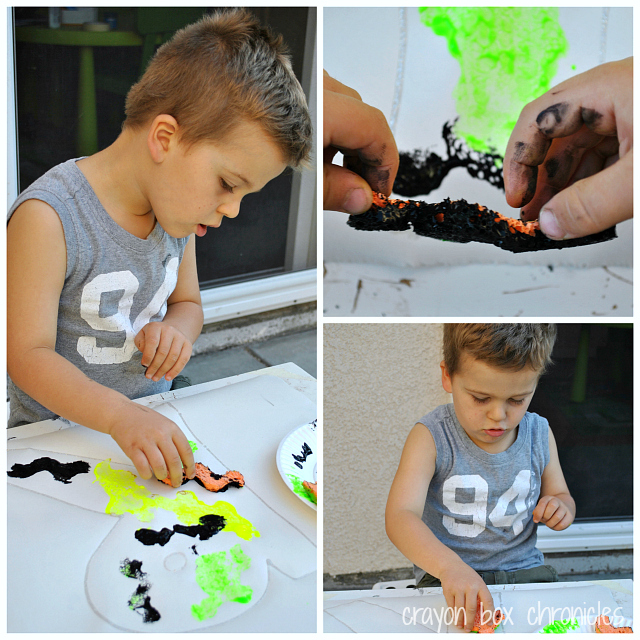 Sponge stamping is such a fun way to exploring painting! You can experiment with different animals or shapes too! 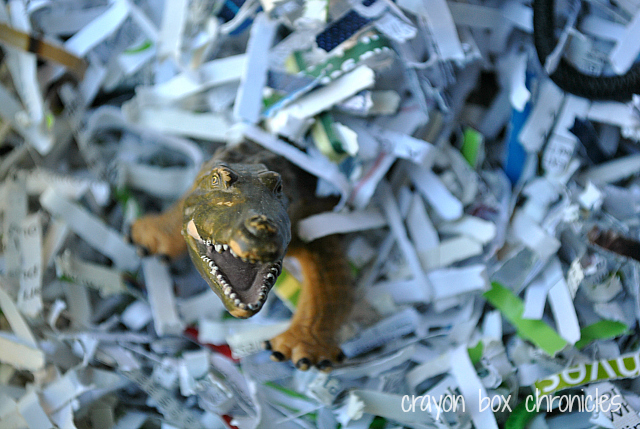 Paper, paper, and more recycled paper! 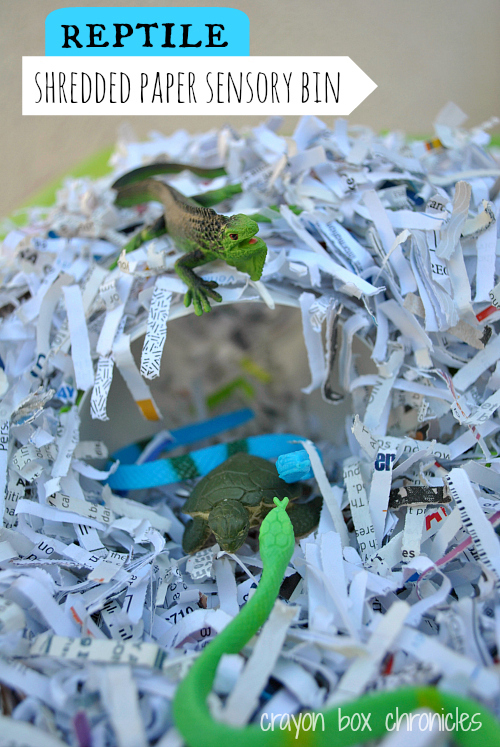 Add reptiles, tunnels, and a boat-load of sensory play for simple and educational fun! R is for recycled too! C could spend hours playing with PVC pipe, tunnels, and paper towel rolls! Baby O’s containers are prefect for sensory bins and small world play! Simply, cut the end off, ensuring the edges are smooth. Total set up was less than 5 minutes and uses all recycled materials! Those snakes, iguanas, and turtles love the tunnels too! Watch out! That alligator has a mean bite! 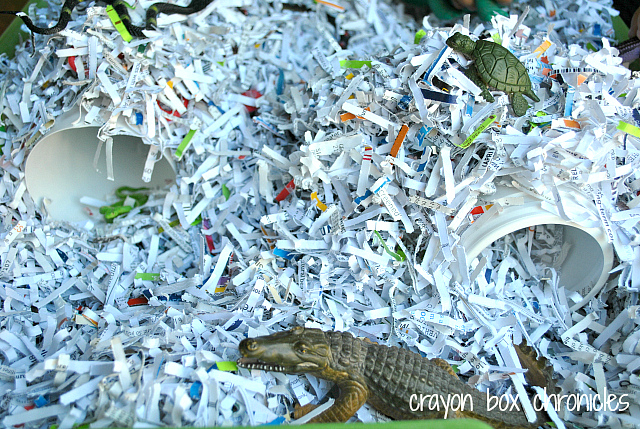 No recycled reptile bin is complete without the ferocious and scaly alligator! I just adore C’s facial expressions! He had a blast! 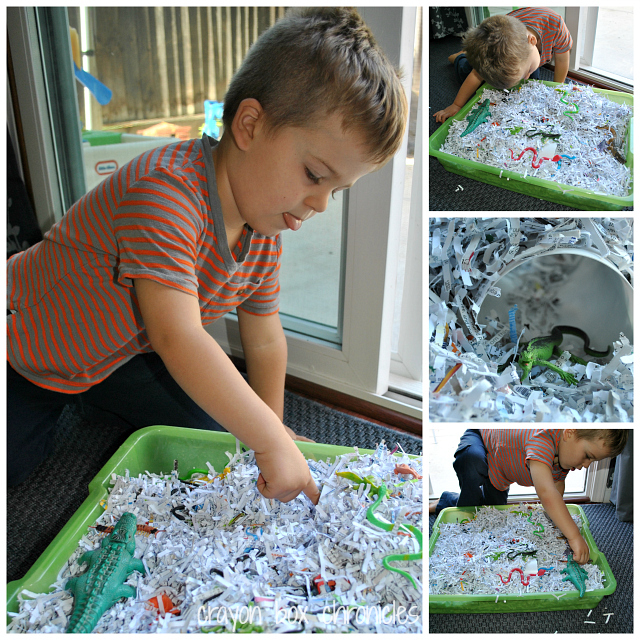 Simple, fun, and full of imaginative and sensory play! Here’s my little reptile hatchling! He runs up to me and says, “Mommy! Mommy! I’m an egg, cover me!” He continues, “screech, screech” as he hatches! Too cute! Love his imagination! Join us on Facebook, Pinterest, Twitter, Bloglovin’, and Google+ as we explore play! Now it’s your turn! Link-up your R related posts! Just click the cute blue link character! Love those faces! And such a cute egg-hatching idea! Pinned! Hi Sara. Thank you so much! 🙂 It’s super messy fun! Oh this is so fun! My son would love all of these activities. I especially love the hatching reptile at the end! Thanks for participating in this series! thank you Leanna. And thank you for including us in your wonderful series!